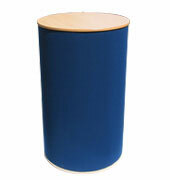 Simple, versatile, round display plinth, with full outer-edge wrap. Variety of widths and heights available. Lightweight, easy 3-part assembly, useful internal storage. Smart and ingenious foldaway beech counter with beech outer-edge wrap. 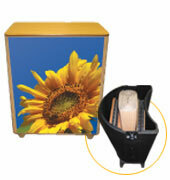 Lightweight, with easy 3-part assembly and useful internal storage. The case fits inside the counter (accessory). 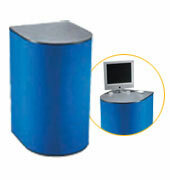 Multi-function, D-shaped counter with outer-edge wrap. Straight back designed to fit against any display. Lightweight, easy 3-part assembly, useful internal storage. 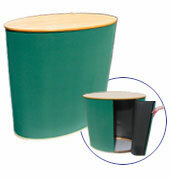 Popular, multi-purpose counter with large elliptical work-top, full outer-edge wrap. 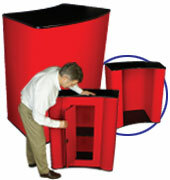 Lightweight, easy 3-part assembly, large internal storage. Reception style counter with deep, curved worktop. Nova 1: full outer-edge wrap. Easy 3-part assembly, large internal storage. Nova 2: contour wrap, rear access to ‘knee-hole’, solid base and shelf.